Hello people of the internet!!! Do you love amazing bands with fun, energetic songs such as: Boys Like Girls, Fall Out Boy, Yellowcard, 5 Seconds of Summer, and The Vamps, then you’ll love today’s ‘YouTube Wednesday’ featured band. This band has spent the past few years steadily playing gigs, adding AMAZING songs to their repertoire, and building a fanbase that has given them 118,000 Twitter followers, 15,422 YouTube subscribers, and 21,158 Facebook likes. So if you aren’t already a fan of An Honest Year, then you’re behind on what’s soon to be your next big musical obsession. So please read on, and learn why YOU will soon become COMPLETELY obsessed with An Honest Year (you’re welcome in advance!). An Honest Year is a Pop/Alternative band from Philadelphia, PA. The band consists of: Matt McKay (lead vocals), Stephen Morrell (lead guitarist), Jon Pfingsten (rhythm guitarist), Jordan Mitchell (bass/vocals), and Greg Pinney (drums). The band made a powerful debut on to the music scene, with their September 2012 self-titled EP. The EP helped the band begin to earn a loyal fanbase, and thus allowed them to sell out numerous local shows. An Honest Year has also had the privilege of sharing the stage with numerous popular bands such as: twenty one pilots, Switchfoot, New Politics, MS MR, Rookie of the Year, Sandlot Heroes, Dinner and a Suit, Phone Calls From Home, and more. The band further solidified their place in the hearts of their fans with the release of their latest EP ‘Moments’ in September of 2013. 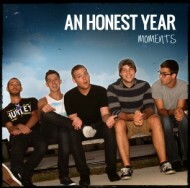 An Honest Year uploaded its’ first YouTube cover video on February 5th, 2013. In the video, they covered Coldplay’s track ‘Sparks’ (Coldplay – Sparks Cover (An Honest Year)). The members of the band (that participated in the cover, the whole band was not in the video) do an amazing job of delivering the emotional intensity that this song requires, and in doing so, prove that An Honest Year are not just phenomenal musicians, but true artists. Coldplay can often be a hard band to cover, because their songs are not only beautifully performed, but also have a haunting affect that gives the band a unique sound. An Honest Year is able to take this song and put a new spin on it that makes their rendition equally haunting and alluring, in its’ own way. I personally love it when a band/artist is able to make a song their own, while also keeping the original version’s charm intact, luckily for us, An Honest Year is able to pull off this task like true pros. The next cover that we are going to discuss is An Honest Year’s take on the Boys Like Girls hit song ‘Thunder’, which was uploaded on September 16th, 2013 (Boys Like Girls – Thunder Cover (An Honest Year) – YouTube). I really loved this version of the song, because it was even more stripped down and raw than the original version was, which made the track even more amazing. Once again, the band members in the video were able to properly deliver the emotional content of the song, but do so in a way that felt totally unique to An Honest Year’s sound. I really felt that the members of the band connected with the song, and because of this were able to make me feel as if they meant every word and note that they were performing. Honestly if I didn’t know any better I would have thought that this cover was one of the band’s original songs. I definitely hope that they cover more Boys Like Girls songs in the future (hint hint!). The last cover song that we are going to discuss in this blog post is An Honest Year’s rendition of the hit single ‘She Looks So Perfect’ by 5 Seconds of Summer (which you know has become one of the BIGGEST songs of the summer of 2014). This cover was uploaded on February 10th, 2014 (5 Seconds Of Summer – She Looks So Perfect Cover (An Honest Year) 5SOS – YouTube). When I saw that they covered this song, I was a little worried because the original version of this song is so awesome. Luckily my fears were unfounded, because An Honest Year did an INCREDIBLE job of keeping the upbeat, energetic vibe of this song alive, but also breathing a fresh feel into the track. This is honestly one of my favorite covers that An Honest Year has posted, because I feel that it really shows that this band is the total package. I definitely suggest that you all check out this cover, because you will fall in love with it. Next, let’s move on to An Honest Year’s original material, because we all know that the mark of a truly great band is whether or not they can produce their own amazing original material. I really loved the band’s debut self-titled EP, because the sound was really different than a lot of the Pop/Alternative rock that you hear on the radio today. The whole EP felt like a trip back to the mid 2000’s, and definitely showed the influence that popular bands during that time had on An Honest Year. The EP contains themes of love, loss, and basic confusion about the world. I really loved how honest the songs felt, which resulted in a very relatable EP that I would certainly find myself listening to on repeat (trust me you will too). The band released an acoustic version of their next track ‘Your Forgiveness’, which was released on YouTube and SoundCloud on December 2nd, 2012. This track stayed with the sound that An Honest Year has cultivated, and proves that this amazing band has the passion and talent to handle an acoustic performance without losing a step. On May 12th, 2013, the band released the official music video for their song ‘Liars & a Thief’ (An Honest Year – Liar & a Thief (Official Music Video) – YouTube) off of their Moments EP. The video follows the lead singer (Matt), as he falls for a really pretty girl, who continuously uses and abuses him, and he is “powerless” to stop. At the end of the video, the band members begin to approach the girl in the video and her group of pretty friends, and the girls attack the guys. It is a really funny video, which adds to the high energy of the track, and makes it even more amazing. The Moments EP also contains a non acoustic version of ‘Your Forgiveness’, which is fun, upbeat, and honestly makes me conflicted about which version I like the best (it’s a serious problem you guys). Although I honestly love the entire EP, some tracks that I feel deserve a special shout out, include: ‘Don’t Leave Me’, (which has moments where the vibe of the song ventures into a harder alternative rock sound. A bit into the realm of the band Breaking Benjamin, definitely a change of pace for An Honest Year, but they pull it off nicely), the inspirational ‘Live Your Life’ (which I can’t stop playing on repeat), and of course the title track ‘Moments’ (which is about not letting those precious moments/important pass you by. Although I picked these particular tracks out, I would honestly suggest that you listen to the whole record, because you WILL love it). I also really loved this EP, because An Honest Year experimented with their sound a little bit, but did not lose the essence of who they are (which is really easy for an artist/band to do). Also, you can certainly see how much hard, meticulous work went into making this EP (which I appreciate because hard work equals passion, and I love to listen to artists/bands that are passionate about what they do). . These two projects, along with the band’s cover videos certainly make me excited for the next project that the An Honest Year will release. With infectious hooks, and powerhouse instrumental and vocal skills on their side, it is easy to see that An Honest Year will very soon become a staple on all of your music playlists. I have no doubt that this band is on its’ way to having a long career in the music industry, and will certainly make a lasting legacy for themselves. It’s not very often that a band is able to make such an immediate and powerful impact on fans, so the fact that An Honest Year is on such a steady rise definitely speaks volumes about the band’s advanced level of artistry, and their future in the industry. They are truly on a roller coaster that only goes up (sorry I had to throw a little ‘The Fault In Our Stars’ reference). I am so excited to see what is next for this limitless band! So if you haven’t listened to their music yet, what are you waiting for!?! I highly suggest that you check out An Honest Year’s music, I promise that you will become completely addicted to every one of their tracks. Have I ever lied to you before people of the internet? Then go on and meet the band that you will become obsessed with for the rest of the year (and many more years to come after that). All photos and information used in this blog belong to An Honest Year, Twitter, YouTube, Instagram, any person/business/corporation/etc. associated with in any shape or form with An Honest Year, Twitter, YouTube, Instagram, SoundCloud, anhonestyear.com, Coldplay, Boys Like Girls, Fall Out Boy, Yellowcard, 5 Seconds of Summer, The Vamps, An Honest year’s Website, The Fault In Our Stars, twenty one pilots, Switchfoot, New Politics, MS MR, Rookie of the Year, Sandlot Heroes, Dinner and a Suit, Phone Calls From Home, An Honest Year’s Merch Store and/or their website, Matt McKay, Stephen Morrell , Jon Pfingsten , Jordan Mitchell, Greg Pinney, and all other original owners. I do not own anything in this blog. All opinions expressed in this blog are my own. I wrote this blog for entertainment purposes and no copyright infringement is intended. celindareyesblog August 7, 2014 No Comments on YouTube Wednesday: An Honest Year…the new band that you will honestly never get enough of this summer. Category: YouTube Wednesday. Tagged: 5 seconds of summer, alternative, An Honest Year, Artists, band, boys like girls, breaking benjamin, fall out boy, music, musicians, new, pop, rock, youtube. Hello people of the internet!!! On today’s ‘Monday Memos’ we are going to discuss an INCREDIBLE new band whose member’s heart’s are just as big as their musical talent. Trapdoor Social has made numerous strides in the industry thus far, and is on the verge of becoming YOUR new favorite band. As the wise philosopher Augustus Waters once said, they’re “…on a rollercoaster that only goes up…”. So people of the internet, let’s get started! Merritt Graves and Skylar Funk of Trapdoor Social met at Pomona College (located in Southern California) during an environmental program. The band introduced themselves as a musical force with the release of their 2012 EP ‘Death Of A Friend’. The EP fused the band’s musical influences into an incredibly strong introduction that alternative rock fans would definitely gravitate towards. ‘Death Of A Friend’ was produced by Curt Schneider, and features Death Cab For Cutie’s drummer Jason McGerr. The EP quickly became a hit due in part to the single ‘Like You Never’ (which received radio play from a number of major market stations around the US). On May 20th, 2014 Trapdoor Social released their latest EP ‘Science of Love’. The EP produced two AMAZING singles entitled ‘Science of Love’ and ‘Angel City’ (you can see a live in-studio version of ‘Angel City’ here:Trapdoor Social – “Angel City” (Live at Bedrock Studios) – YouTube). While working on ‘Science of Love’ (the EP), Trapdoor Social became connected with ‘Homeboy Industries’ (a non-profit that allows former gang members the opportunity to find jobs as they re-enter society). Due to the band’s passion for the environment and music, they agreed to partner with ‘Homeboy Industries’ and generosity donated 100% of proceeds from ‘Science of Love’ towards adding a solar rooftop to the company’s headquarters. Ok, now that you know Trapdoor Social’s background let’s dive into the music. Ok? Ok! I found the band’s first EP ‘Death of A Friend’ to be a very diverse record. I definitely suggest this EP to all fans of rock music, no matter what your particular tastes within the genre may be. After listening to the EP, I can definitely see why tracks such as, ‘Like You Never’ (which was the single off of this EP, please check out the music video here Like You Never), were such big hits for Trapdoor Social. ‘Like You Never’ has very fun lyrics, and the overall vibe is very comparable to the sound ‘Blink-182’ had in the 90s, fused with Jimmy Eats World (specifically the sound they had on the track ‘Hear Me You’). The album itself also contains songs that will resonate with fans of bands such as: American Authors, Simple Plan, and Metro Station. Basically if you’re a fan of any sub genre of rock, you will LOVE this EP. Next we move on to the band’s latest EP ‘Science of Love’ (you may now say yay…ok, ok let’s get on with the music). I really liked that ‘Science of Love’ showed the band’s growth, but did not completely waver from ‘Death of A Friend’. The EP allowed the band to step a bit out of its’ comfort zone with tracks such as ‘Paper Love’ and ‘Out Alive’ (the two tracks had a very pop feel, similar to Maroon 5 and The Fray), but also keep a familiar vibe with songs like ‘Science of Love’ (the track that shared the same title as the EP). Speaking of the track ‘Science of Love’ (you can find the official music video for this track here: Science Of Love – Offical Music Video), let’s discuss this single a little more. In April of 2014, Trapdoor Social discussed the track ‘Science of Love’ with antimusic.com, and stated that “Often love can bring out the best in us, allowing us to create things we would have never been able to absent the inspiration, but it can also encourage us to be reckless and take risks in its attainment”. This track is a fun, radio friendly song that will DEFINITELY find its’ way onto your music libraries, and keep you dancing all summer. The band’s newest single ‘Angel City’ (you can see a live in-studio version of the track here: Trapdoor Social – “Angel City” (Live at Bedrock Studios) – YouTube), is a very powerful song that will have you singing along in no time. This track really gives the EP a unique identity that makes it instantly recognizable. This makes it a perfect radio song for Trapdoor Social, because fans would instantly recognize this song, and new fans would be intrigued and left wanting to know more. So are y’all addicted to Trapdoor Social yet!?! You’re welcome! But seriously people of the internet, I do have a question for you. Do you want to be the first to fall in love with a band that will very soon become a household name? Do you want to find new, AMAZING music that will become the soundtrack to all of your favorite summer memories? Don’t you want to support a band that is not only 100% dedicated to their music, but also to the important causes that are near and dear to them? The answer to all of these questions is yes (but I know that you already knew that). So I suggest that you all become very familiar with Trapdoor Social because very soon this powerhouse band will be inescapable. celindareyesblog June 30, 2014 No Comments on Monday Memos: Trapdoor Social. Great Music, Big Hearts. Category: Monday Memos. Tagged: alternative, awesome, band, catchy, fun, indie, music, new, rock, trapdoor social. Monday Memos: Altered Sky, the band that will soon become your new summer musical obession!!! Home | Monday Memos | Monday Memos: Altered Sky, the band that will soon become your new summer musical obession!!! Hello people of the internet!!! Do you like amazing bands like Paramore, We Are The In Crowd, and Tonight Alive?!? Then get ready to meet your new favorite band Altered Sky. If this band doesn’t sound familiar now, this will change VERY soon. Although Altered Sky has been compared to numerous great bands, they have been able to separate themselves from the rest through their artistry and meticulous hard work. So if you want to learn all about the band that will soon take over the music industry, please read on. Altered Sky is a 5 piece band from Glasgow, Scotland. They formed in 2010, and in the past few years have made great strides in the industry. The band includes: Ana Nowosielska (vocals), Amy Blair (drums/backing vocals), Neil Ramsay (guitar), Richard Passe (guitar), and Ross Archibald (bass). Altered Sky played in numerous ventures throughout Europe, such as: Edinburgh’s Picture House (in Edinburgh, UK), headlining gigs at the 100 Club (in London), and Camden Barfly (in London). They have also opened for bands such as American pop/punk group We Are The In Crowd. Altered Sky released their first single ‘Apple Tree’ on November 14th, 2010 through the music sharing website ‘Bandcamp’. The official music video for ‘Apple Tree’ was released on February 4th, 2011 on YouTube. They released their first EP ‘In This World’ on July 15th, 2011 also through ‘Bandcamp’. The band released an official music video for the track ‘I Know You Know’ on July 7th, 2013 on YouTube. The ‘I Know You Know’ music video was also featured on the rock music website ‘Kerrang!’ and various TV music channels. On March 16th, 2014 Altered Sky dropped their debut EP ‘Stop and Live’. The EP was recorded in Cardiff’s famous Longwave Studios, and was produced by Romesh Dodangoda (who has previously worked with the bands: Motorhead, Kids In Glass Houses, and Funeral For A Friend). Altered Sky released their official music video for their track ‘Where I Belong’ December 23rd, 2013 through their official VEVO YouTube channel. Now that you all know everything about Altered Sky, let’s get into the music! Yay! The band’s first track ‘Apple Tree’ is a song that I really loved, because it gives Altered Sky a great introduction to fans. The track has a very 90s rock vibe, (think in the lane of Papa Roach and Blink-182) infused with a modern punk/rock sound. The music video opens with a guy and his girlfriend sitting together at a restaurant. They then leave the restaurant and do walk together through the snow holding hands. The guy then goes to a bar and flirts with a girl there. He is at a table holding the bar girl’s hand, but his girlfriend sees him. The bar girl sees realizes that he already has a girlfriend and walks off. At the end of the video, the guy and his girlfriend meet at the same restaurant that they were in the opening scene, and she breaks up with him. The next music video that they released was for a track entitled ‘I Know You Know’. The song has a very punk sound that keeps with the vibe that Alternative Sky fans have come to love. The video shows the band performing, as they would in a concert setting. The lighting in the video is very dim, except for lights in the back of the stage, which adds a cool edgy effect to the video. This use of lighting really sets this video apart from your typical music video (which once again shows how much Alternative Sky prides themselves on their originality). On the back of the stage, the lights illuminate these really cool flowing sheets which just brings the entire staging together, and really flows with the cool, edgy vibe of the video. Alternative Sky’s latest video is for the track ‘Where I belong’. This is a very energetic song, which is definitely one to have in you “rocking out” playlist for the summer. In the video, the lead singer awakens in a bed hung from a tree by ropes. In another scene she is dressed like little red riding hood, while walking with a teddy bear. She then drops the bear and it becomes life-sized. The bear then becomes small again and, she runs with it through the woods while several other fairytale figures emerge. They then jump around with balloons surrounding them for a while, and in one of the later scenes, the ropes holding her bed break and she then wakes up in her room and discovers it was all a dream. So as you can see, Altered Sky definitely has the talent, ambition, and artistry to go far in the music industry. . I anticipate big things for this band in the future, and am anxious to see how their artistry grows as the years pass. I also anticipate that Altered Sky’s dedicated fan base will continue to grow, and thus give the band many more opportunities in the future. If you aren’t a fan of Altered Sky yet, then I only have 1 thing to say to you…what are you waiting for!?! If you give this band a minute of your time, then I promise that your ears will thank you…your wallet might not like you so much, but why let that get in the way of awesome music! Keep up with Altered Sky!!! All photos and information used in this blog belong to Altered Sky, YouTube, VEVO, Twitter, Facebook, Website, Bandcamp, Paramore, We Are The In Crowd, Tonight Alive, Ana Nowosielska, Amy Blair, Neil Ramsay, Richard Passe, Ross Archibald, 100 Club, Camden Barfly, Edinburgh’s Picture House, Longwave Studio,Kerrang!, Motorhead, Kids in Glass Houses, Romesh Dodangoda, Funeral For a Friends, Blink-182, Papa Roach, and all other original owners. I do not own anything in this blog. All opinions expressed in this blog are my own. I wrote this blog for entertainment purposes and no copyright infringement is intended. celindareyesblog June 24, 2014 No Comments on Monday Memos: Altered Sky, the band that will soon become your new summer musical obession!!!. Category: Monday Memos. Tagged: altered sky, alternative, apple tree, band, bandcamp, blink182, edinburgh, edinburgh picture house, europe, facebook, kerrang, kids in glass houses, longwave studios, motorhead, music, papa roach, paramore, punk, rock, romesh dodangoda, scotland, tonight alive, twitter, vevo, we are the in crowd, youtube.